Buy 1 for $30.32Buy 2 / Save $1.62!Buy 3 / Save $6.07! Echinacea is found in scattered patches in rich prairie soil or sandy soil from Alabama to Texas and northwestward, being most abundant in Kansas and Nebraska. This herb grows to a height of from 2 to 3 feet, sending up a rather stout, bristly haired stem bearing thick hairy leaves from 3 to 8 inches long. The flowers, which appear from July to October, vary in color from whitish rose to pale purple. The flower heads are ornamental and consist of ray and disk flowers. The brown fruit ing heads, which develop after the flowers, are conical, stiff, and chaffy. The plant has a thick, blackish root. Most of the actions of Echinacea can all be related to proper immune system functioning. In times of stress, in harsh environments or seasons, whenever the body is in need of reinforcement, Echinacea may supply the boost required to maintain the lines of resistance, to mend injured tissue, and to help stimulate healthy body functioning. The common cold, gastroenteritis, mild to moderate infections of all kinds are still fair game for the use of Echinacea, but the main use of the plant is to boost the immune system. Echinacea is a traditional herbal health used to help support sore throats due to colds. The health properties of this popular herb was originally discovered by the Native Indian many years ago. The two most potent species of this plant include Echinacea angustifolia and Echinacea purpurea. In all studies, Echinacea has no known toxicities, however, individuals with auto-immune issues (ie. Multiple Sclerosis, immunity deficiency, etc.) are cautioned not to use Echinacea unless directed by a physician due to its potential immune-stimulating properties. Also, those with allergies to plants in the sunflower family should avoid taking Echinacea. Hot tea brewing method: Bring freshly drawn cold water to a rolling boil. Place 1 tea bag for each cup into the teapot. Pour the boiling water into the pot, cover and let steep for 2-4 minutes. Pour into your cup; add milk and natural sweetener to taste. If symptoms are severe or persist for more than two days, consult a physician. Echinacea is contraindicated in those with an auto-immune disease (ie. Multiple Sclerosis, AIDS etc.) or allergies to plants in sunflower family. Not recommended for preqnant or lactating women or those with allergies to soya. 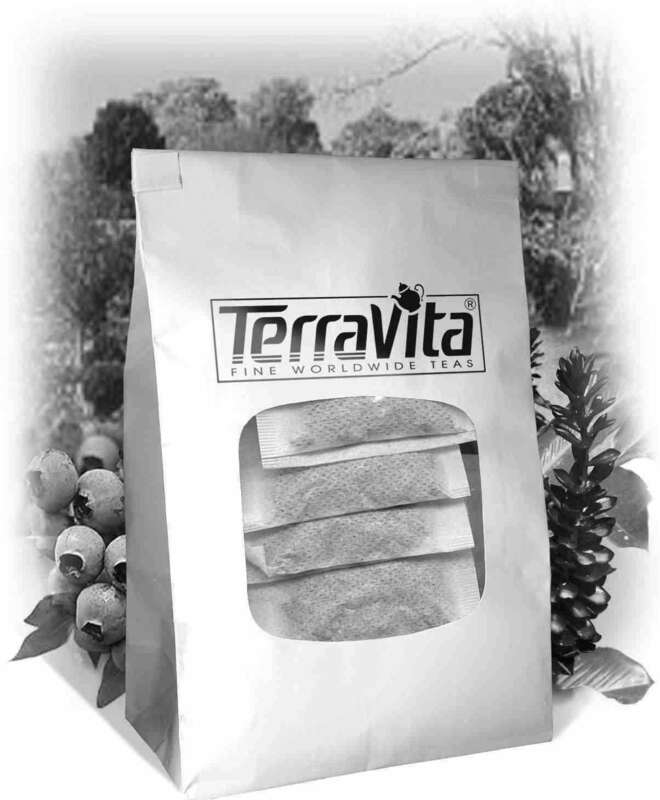 The TerraVita Premium Collection uses only the finest, purest and most potent plant extracts from around the world. The TerraVita Premium Collection is hallmarked by the highest possible standards of purity, potency, stability and freshness. Our highest possible standards are certified by independent laboratories and backed by our personal guarantee.